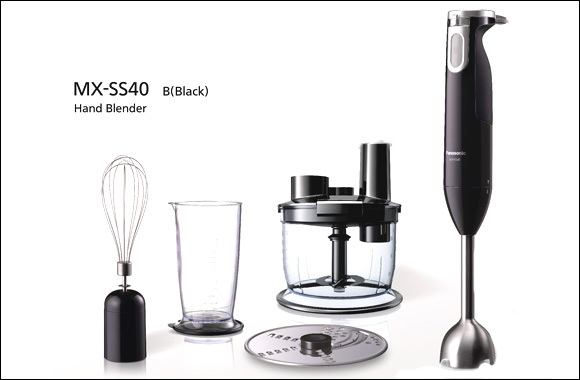 Dubai, UAE; June 8, 2015: Simplifying meal preparations,Panasonic Marketing Middle East and Africa (PMMAF) has introduced an all-rounder 4-in-1 Hand blender, MX-SS40 capable of multi-functions like chopping, shredding, slicing and whisking.With the latest high blending performance, cooking a variety of delicacies is now more convenient than ever. The powerful 600W motor with step-less control drives 2 straight and 2 blending blades which deliver powerful performance and quick efficient blending for smoothies, sauces, fast dips, soups, baby food, and more. Deluxe, durable stainless-steel blender shaft easily reaches into deep bowls, pots and pitchers - safe for hot/cold foods and beverages. The shaft goes directly into the pan for soups and saucesand the ergonomic, sure-grip handle provides safety, comfort and control. Designed for everyday cooking,with the 4-in-1 hand blender you can simply switch attachments to blend, chop, slice, shred and whisk. It is ideal for both daily meals and special delicacies for a house party. The chopper attachment simplifies preparation by chopping foods like onion and meat. Switching to the disc blade lets you slice or shred the vegetables and fruits. The whisk attachmentprepares whipping cream or egg white, for quick and delicious desserts. The easy to grip handle snugly fits your hand, and the stainless steel shape beaker and chopper bowl are all dishwasher friendly for easy cleanup. With aesthetically appealing design, this one-do it all hand blender also stores neatly on the wall bracket to keep the kitchen counter organized, while staying right at your fingertips when you need it. The MX-SS40is 4-in 1 kitchen all-rounder which paves way for effortless cooking. It is priced at AED 249.The product is currently available with Al- Futtaim Panasonic (AFP) and also across all Lulu branches.